Ajahn Brahmavamso Mahathera (known to most as Ajahn Brahm), born Peter Betts in London in 1951, is a Theravada Buddhist monk. Ajahn Brahm grew up in London and earned a degree in Theoretical Physics from Cambridge University. Disillusioned with the world of academe, he trained as a monk in the jungles of Thailand under Ajahn Chah. A monk for over thirty years, Ajahn Brahm is a revered spiritual guide and the abbot of Bodhinyana Monastery, in Serpentine, Western Australia—one of the largest monasteries in the southern hemisphere. 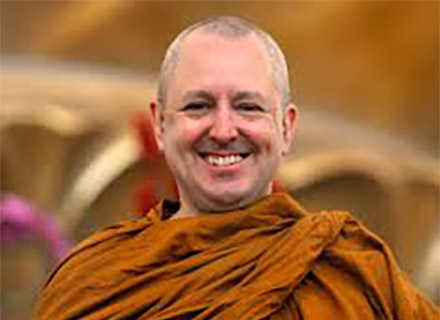 He is also the Spiritual Director of the Buddhist Society of Western Australia, and spiritual adviser and inspiration for Buddhist centers throughout Asia and Australia. His winning combination of wit and wisdom makes his books bestsellers in many languages, and on his teaching tours Brahm regularly draws multinational audiences of thousands.